OK, I will try it on my desktop that has 16gb. I don't need to change the -xms value, right? Great, that should be enough, atleast as of todays update where some optimizations were made. I will consider some kind of simple view where hands are merged further for a better overview. You could filter on something like ! (PPT syntax of obvious hands), however. Also, there are no different % rankings for 6h and HU, so 20%6h will not work. 20% will likely not correspond exactly to 20% in PPT either. recently purchased the solver. I am getting an error: out of memory message when I start the sim for a 3 handed 10bb holdem sim, with a minrasie btn option, an iso option for each of the blinds, and a .5pot betsize all nodes postflop. I am not getting the error message when I do a 100bb sim with ample betsize options. My machine has plenty of RAM. I also tried setting -Xmx6g to 8g. Any ideas? Another question, I'm still unclear how to load solutions into the viewer. I made a folder named ranges in a folder where Monkerviewer is location. Under local in the viewer it shows the sim but nothing loads. What does the RAM estimate available in the setting tab say about the tree? I suppose with btn limp, it could exceed 8gb. The subfolder structure need to remain as exported from the solver. The easiest way is to just move the MonkerViewer.exe to the MonkerSolver folder. I'm looking to add a setting for this, but it will increase the size of the trees considerably, with probably little effect on streets other than the river. I understand. Thanks for all the quick updates. -ah, it was saying 11.16GB with btn limp. 5GB with it removed. its running now. can you quantify run time or iterations in terms of sim size (say per 5GB). I.e if I have a 5GB PF sim, how many iterations should I generally go for? Still doing something incorrectly with the viewer, see below. I pasted the folder from saved runs into ranges. You probably want around 10-20 billion iterations. Use the reset average after the first half. Right, the "save run" is only for monkersolver. 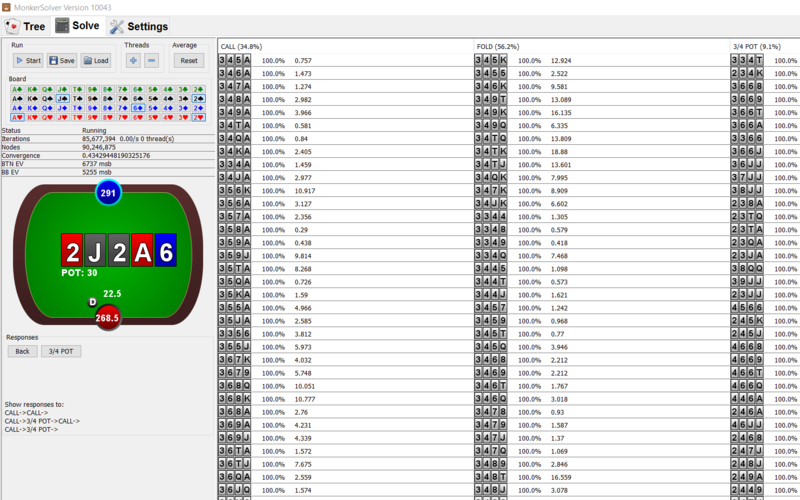 Load it back into the solver and then right-click the result table when viewing any preflop node and choose "Save tree as ranges" to save the preflop ranges in monkerviewer format. what do you think about if you add a betsize to all postflop nodes, it does not add donk bets unless specified? Does this software generate OR ranges for all 6max positions based on equilibrium? What does that ranges look like, they naturally take playability into account? Also are this ranges exportables so for example, being possible to analyze with pro poker tool range explorer? Would it be possible to re-solve rivers to take into account missed flush draws as a sort of compromise? So as an example, a full tree would ignore suits that are not flushes on the river. This would be used for solving anything from flop or turn on. However, after navigating to the river, MonkerSolver could then re-solve and take into account missed flushes. I believe PioSolver does something similar where it re-solves the river on the fly. It does this with smaller save files so people don't have to save the entire tree. Something like this might be a viable option. Yes. PioSolver also has a function called "create subtree configuration" where the ranges and bet sizing settings on the current street are copied to the configuration tab so that you can recalculate turns/rivers more accurately after calculating from preflop/flop. So I agree that this would be a great idea to implement, especially given that abstractions are used, as Antidote pointed out. Is there any way to have the ram estimate for omaha preflop? ran a PF plo sim last night, it said it was roughly 7GB in size. midway during the turn creating of tables it crashed and said out of memory. my machine has 24GB and currently running at ~30% so I'd expect it had at least 12-16GB available last night. at this rate I'm probably going to want to move this to a cloud computer so I can run bigger sims and not worry about it running out of memory. I cant remember what it said about # of computer limitations. Is it setup to do this? Yeah, that's an interesting idea. I'll consider adding a way to create your own quickfilters (adding to all postflop nodes w/o donk is just custom filter->check pre and donkbets). In case OR means open raises, yes, if you have to RAM to solve such a tree, which would probably be ~100gb. I'm not sure what the definition of playability is. It should be possible to export the ranges to PPT, yes. Good idea. That should be possible. There is one, which should be fairly accurate. However, it does not take into account creating the omaha tables, which only needs to be done once and requires around 15g RAM. As in the answer above, creating the omaha tables requires around 15g. It's possible you ran short just barely. Please try to free up most memory some night and generate the tables with atleast -Xmx15g set. You may run the program on a cloud if you wish, yes. There's no button when the tree is preflop, the estimate is instantly available. It's in between the parentheses, "Abstraction (5.529 GB)". How do you export the ranges to PPT? I'd like to do this so that I can analyze them away from MonkerWare. If I right-click "Save tree as ranges" nothing happens. I'm talking about post flop ranges. Click the result table header, which reads something like "CALL (50%)" to export the call range. You will find the file in the "ranges" folder. I realized however that this exports the ranges with decimal weighing, which I believe is not supported in PPT. This has been fixed in the latest version. The convergence value was not accurate and accidently slipped through one update. It is removed and still work in progress. Is it only the full version that's been updated? Can't seem to find any update for the free one? Minor suggestion. Can you add the date next to each update number after MonkerSolver updates? When MonkerSolver auto-updates and I see the entire list of updates, I'm often unsure which ones are new.